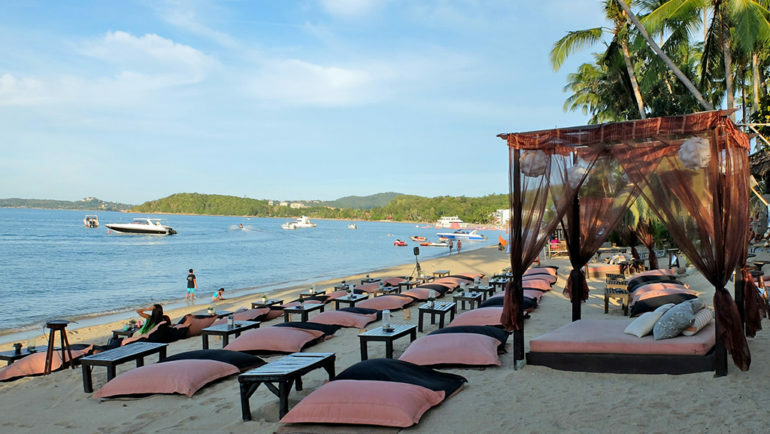 Sunsets and sundowners go hand in hand, particularly if you’re holidaying in tropical Samui. 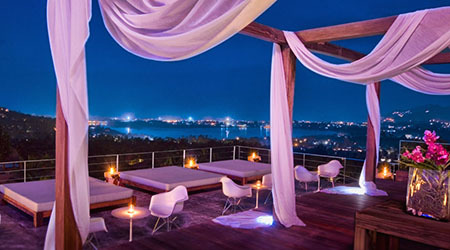 And what better place to watch the vibrant hues paint the sky, than at a chic and airy rooftop bar? Panoramic ocean views, chic decor and classy vibes – Zama Restaurant‘s got it all. The sleek interiors, featuring low lighting and tasteful furnishing, is discreet, elegant and inviting. 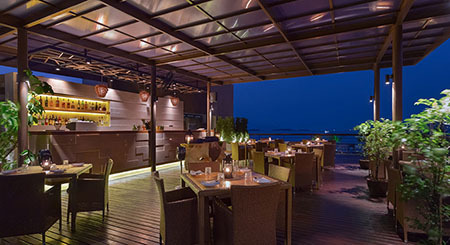 When the restaurant occupies a prime rooftop location like Zama, there’s little need for elaborate decoration; the understated interiors draw the eyes to gaze out at Bangrak’s stunning coastal scenery and a sparkling pool. Needless to say, the inviting setting and scenic environment at Zama makes it an ideal spot to enjoy an evening sundowner or two. Cocktails here come with playful names, such Toffee Apple (a fruity drink with caramel flavours), Rosie’s Zippy Rhubarb with Gold Tequila, and an eclectic-sounding Electric Soup (a delightful mix of vodka, malibu, ginger, kaffir lime leaves, lemongrass and chili go into this exotic drink). 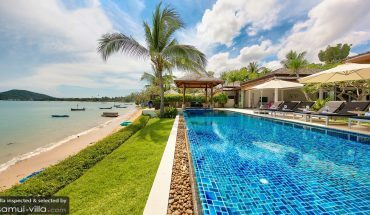 Vacation makers who aren’t quite in the mood for cocktails may take their pick from an impressive selection of wines and champagnes. 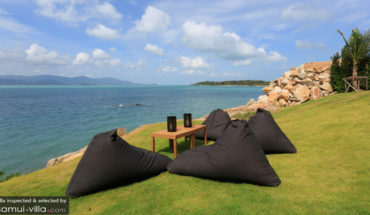 Set upon the clifftops, Air Bar is primed to offer stunning vistas of Samui’s picturesque coasts. There’re few places better than this for enjoying a mesmerising sunset show; the bar’s location along the west coasts of the island means that guests will set sight on a striking scene made up of beautiful sunset colours each evening. Visitors enjoy more than just spectacular views here. World-class mixologists man the bar, their swift and nimble hands crafting one cocktail after another. Top-notch drinks should be paired up with top-class bites, and the tasty nibbles filling up Air Bar’s menu will not disappoint. An enviable evening starts off with a round of cocktails in a fine setting. If you’re looking for a rooftop spot, 9Gems has got all the right boxes ticked. Classy and contemporary, the bar is decked out in cool white tones and plush fixtures. Silky drapes add a romantic touch, and tea lights placed at each table cast a warm, amber glow. Impeccable service from the staff rounds out an enchanting night. *Do note that 9Gems imposes a trendy or smart casual dress code. Children below the age of 12 years are not permitted. Hours: 16:00 – midnight (Tuesday – Thursday), 16:00 – 2:00 (Friday – Sunday). Closed on Mondays. Sun, Moon and Star – how do you choose, when all three choices are equally appealing? If your plan for the evening is to enjoy a magical sunset show coupled with sundowners, settle down for a drink at Star. There’re countless bar stools lining the edge, but the most coveted seats in the house are the sunken sofas surrounded by water. Of course, reservations are mandatory for these exclusive spots. If you’re hungry for a bite after a round of drinks, indulge in a sumptuous meal at Moon. The restaurant’s polished teakwood fixtures create a cosy setting, and its floor-to-ceiling windows offer unobstructed views of the pool and ocean. 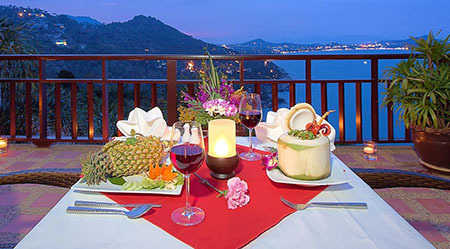 The last option – Sun – is the place to head to if you feel like lingering about in the beautiful compounds of this restaurant. A lovely deck, set above the rocks, offers a private spot for enjoying the coastal scenery while you bask under the moonlight. *Last orders for dinner must be taken before 22:30. Sit back, relax and unwind with a Blue Lady or White Russian at the breezy rooftop decks of Blue Ginger; this prime spot comes with amazing ocean views and refreshing gusts of sea breeze. Need another drink? Take your pick from this list. When the munchies hit, browse through the menu before arriving at a decision: will it be tangy Thai or Western tonight?